Wendy Grant-John is a Senior Aboriginal Advisor at Deloitte. She grew up with cultural values and teachings instilled by her family and surrounding families. 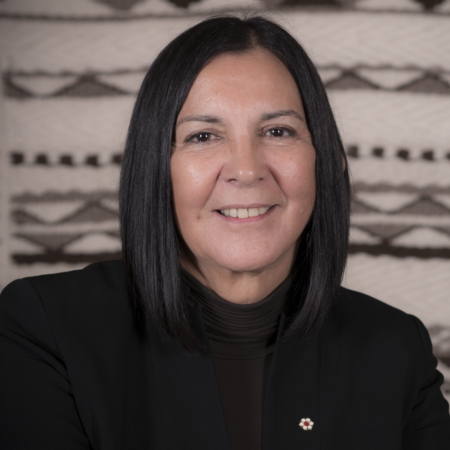 Wendy is a member of Musqueam Chief and Council and has spent most of her adult life working for her community as well as representing First Nations across this country in many different forums. Wendy is a recipient of the Order of BC and has two Honourary Doctorates of Law. Mrs. Grant-John served three terms as Chief of the Musqueam and was the first woman elected Regional Chief to the Assembly of First Nations. As Musqueam Chief, she helped to negotiate one of the first Aboriginal commercial fisheries in Canada. She has previously worked at Indian and Northern Affairs Canada as Associate Regional Director General of British Columbia and has served as a lay bencher of the Law Society of British Columbia and as a Board Member with Canada Lands Company Limited. She has also served as a Commissioner on the Pacific Salmon Commission. She was a founding member and director of the Aboriginal Healing Foundation and a founder of the Musqueam Weavers. Most recently, Mrs. Grant-John was the official Representative for the Minister of Indian and Northern Affairs Canada on the issue of Matrimonial Real Property on Reserve.